Thaw edamame in a colander in the sink (with cold running water) or in two minutes in the microwave. Try to remove and discard any of those tough skins that slip off while you’re rinsing, but don’t drive yourself batty trying to get every single one. Toss the beans in your food processor with the rest of the ingredients. Blend until it’s smooth (but still thick like bean dip’s supposed to be), and freeze any leftovers for up to three months. Layer the edamame dip with your favorite nacho fixings: sour cream, guacamole, salsa (preferably fresh pico de gallo), cheese, sliced olives and sliced green onions. Edamame are quite the rage these days. Most of us only know them from the appetizer menu of our favorite Japanese restaurant, but even people who aren't crazy about tofu love nibbling on those salty little soy bean pods while waiting for their sushi to arrive. If your eyes just glazed over a little, don't worry, I've got something everyone can understand: edamame nacho dip. Most people just go with hummus when they think “edamame dip.” Uh, what is this, 1996? There is more to life than hummus, my friends. There are many ways to dip-ify a bean, and spicy nacho dip is obviously the best of them all. One of the nice things about nacho dip is that you can serve it warm or cold, depending on what kind of party you're throwing. If you want something casual to have with beers and tacos, why not put out a nice seven layer dip—with two pretty green layers? Instead of one green guacamole layer and one brown bean layer, you'll have a green edamame layer. Just layer the edamame dip, sour cream, guacamole, salsa (preferably fresh pico de gallo), cheese, sliced olives and sliced green onions. You can mix it up a bit by adding a layer of chopped pickled jalapeños instead of olives, if you want, or you can make it eight-layer dip and use both. If you want your guests to feel extra special, build little individual layered dips in half pint jars for each person. When you’re looking for a more elegant nacho (I swear there is such a thing), you can top individual chips with a little quenelle of dip, or pipe it out using a pastry bag. If you're very clever, you can even use fancy blue corn chips, or the kind with lime already built in—or you could go Full Soy Healthy Overdrive!! and use those soy and flax seed chips. (Hey, don't look at me like that. I take nachos seriously.) Top each dip-frosted chip with a few strands of cheese, a slice or two of black olive, then broil until the cheese is melted. Top each chip with a delicate cilantro sprig. Edamame is now, baby. 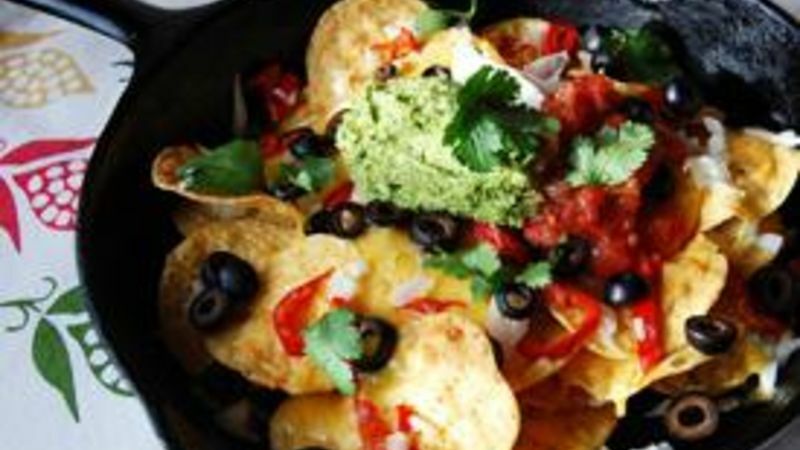 Dare to go beyond hummus, and get your flavonoid on with nachos.